My Soul to Lose is a free short story prequel (free!!!) which is available here at Rachel Vincent’s site. The Premise: This is prequel happens about a year before the events in My Soul to Take, and is referred to in the book. Kaylee is shopping in the mall with her best friend Emma when she sees someone who triggers an attack. It is so bad that Kaylee’s aunt and uncle go to extremes for her own safety- they put her into a psychiatric hospital. My Thoughts: A substantial freebie and worth reading. 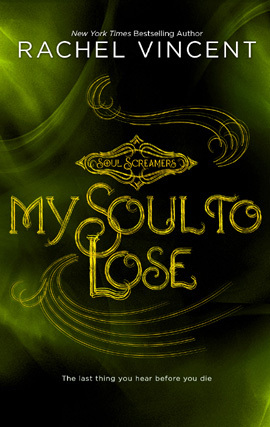 My Soul to Lose fills in some back story mentioned in My Soul to Take, while hinting at Kaylee’s problems in that book. It also was a little illustration on Kaylee’s relationship with her friend Emma – who sticks by her through everything. The setting seemed well researched as well. I’ve visited psych wards and Vincent does well to describe the setting, although I would say in my experience there is a mixed bag – friendly and not so friendly people, not all scary which seemed to be the perception here. I found it interesting that the reader finds out some things in the short story that Kaylee doesn’t remember in the first Soul Screamers book. I’m curious if she begins to remember in later books. I wanted to read My Soul to Take after I saw Tez’s review, and was happy to the ARC at BEA at the Harlequin booth. Harlequin is starting a new Teen line (Harlequin Teen) and My Soul to Take is their first offering. The Premise: Kaylee Cavanaugh is a teen with a secret problem. Sometimes she sees people and knows they’re going to die, and this causes an unbearable compulsion to scream – loud, scary, wails that she has no control over which scares everybody and herself. Her family treat her like she has some kind of panic attack and seem afraid of her episodes. One night Kaylee and her best friend sneak into a nightclub and run into Nash, a very popular guy at school. Remarkably, Nash seems interested in Kaylee, and when she starts feeling an episode coming along, he has an idea of what to do and how to help. But things don’t end there, girls Kaylee’s age keep dying for no visible reason, and Kaylee begins to feel convinced that they were never supposed to die. My Thoughts: Kaylee seems like an average, run-of-the-mill teenager. It seems to be an unremarkable life except for her strange “panic attacks”. I prefer hearing about a “normal” teen, not someone who is a teen cliche, like “the cheerleader” or some other stock character. She isn’t too angsty despite her problems either – she has a balance and a small, but good support system. She approached her problems with a level head even though she was confused and frightened about what was going on. As heroine’s go, she’s not too bad: I wouldn’t call her voice distinct, but she has interesting abilities and life. The world building is the best part of the story. 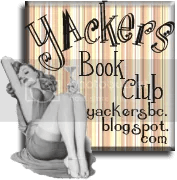 When you first get into the book there are a series of questions that as they get answered, provide the basis for a whole world unbeknown to most. What Kaylee’s screaming really is and why it’s happening. What the people around Kaylee know. How the world we don’t know about works. What Nash knows and how he fits into things. I enjoyed the way the author took a seldom used aspect of the supernatural in this book and put her own spin on it, but I won’t go into detail because that would be spoilerific. I DID come into this with a guess as to what Kaylee was because: girl who senses death and cannot stop a scream? It points to one obvious thing. However, Vincent makes it a little more complicated than that. This is told from the first person point of viewpoint of Kaylee, so we learn as she does at a natural pace as events unfold. I thought this was well done and made me keep turning the pages to learn more. One thing I have to say though: What the hell is up with the adults in this book? They did some questionable things, particularly Kaylee’s dad and his decision regarding her upbringing. I guess his past was his excuse but I found the excuse a little flimsy and felt as annoyed as Kaylee at all the adults around her when she discovers what had been going on. It seemed to be more of a convenient way to keep Kaylee ignorant rather than believable parenting. I hope they redeem themselves in some way in the next book because I wasn’t satisfied here. The other minor issue I had was to do with the romance. I believed that Kaylee and Nash made a cute couple, and Nash seemed to care about Kaylee once he made it known he was interested, but I couldn’t quite trust his explanation for why he was interested in the first place. He’s a known player in school, going from girl to girl and tossing them aside like Kleenex, and suddenly he seems genuinely interested in Kaylee. Kaylee herself half expects his attention to be a big joke and for him to ignore her the next day at school. It’s true that they have more in common then you would initially suspect, but I can’t believe it’s just what Kaylee really is that attracted him, yet that’s what seems to be his reason for noticing her. This didn’t satisfy me as a reason to date someone, and his explanation to Kaylee contradicted his mom’s comment about “finally” meeting her. I hope more is explained in the next book because right now it makes me feel a bit like something is “off”, despite the pacing and other aspects of the romance being fine. Kaylee genuinely seems to connect with Nash, and he is the only one who can calm her or know what’s going on with her “panic attacks” which brings the two of them closer fairly quickly. It just bugs me that his motivations don’t seem clear, and that I know why Kaylee likes him (he’s charming despite her reservations), but not vice versa (but this could be a downside of the first person POV). Hmm. Overall: A solid read. It didn’t bowl me over, but I really liked the world building in this one and there’s enough mystery and suspense in it to keep me reading. There’s a decent teen romance here as well, secondary to the main plot. Although the romance’s pacing is fine I still have an unexplained niggling feeling about it (expounded on above), which may be splitting hairs. I’m interested enough to probably read the second book My Soul to Save which comes out in January 2010. My Soul to Take is released August 1st.